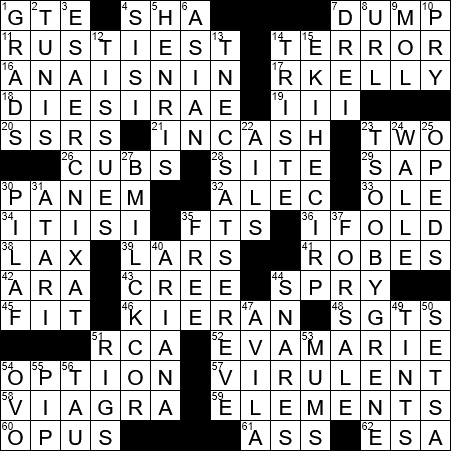 Each of today’s themed clues is a down-answer. But, those answers are written in the up-direction. This is apt, as each answer refers to an act of “going up”. GTE was a rival to AT&T, the largest of the independent competitors to the Bell System. GTE merged with Bell Atlantic in 2000 to form the company that we know today as Verizon. Verizon made some high-profile acquisitions over the years, including MCI in 2005 and AOL in 2015. “Collages” is a 1964 work by French author Anaïs Nin, and the last novel that she had published. R. Kelly is the stage name of R&B singer Robert Kelly from Chicago. R. Kelly was named by “Billboard” as the most successful R&B singer in the past 25 years, and so I guess he has earned his nickname “King of R&B”. Kelly ran into some problems in the press when it was revealed that he had married singer Aaliyah when she was just 15 and Kelly was 27-years-old. “I Believe I Can Fly” is a 1996 hit that was written and performed by R&B singer R. Kelly. Notably, the song was used in the 1996 film “Space Jam”. A prime number is a number greater than 1 that can only be divided evenly by 1 and itself. There are still some unanswered questions involving prime numbers, perhaps most notably Goldbach’s Conjecture. This conjecture dates back to the 1740s and is assumed to be true, but has never been proven. It states that every even integer greater than 2 can be expressed as the sum of two prime numbers. “Sap” is slang for a fool, someone easily scammed. The term arose in the early 1800s in Britain, when it was short for in “saphead” and “sapskull”. Alec Templeton was a composer and pianist from Cardiff in Wales. Active from the 1930s to the early 1960s, Templeton played mainly classical and jazz music. He was also blind, and had been so from birth. 33. Estadio shout : OLE! In Spain, one might hear a shout of “ole!” in “un estadio” (a stadium). “Lars and the Real Girl” is a pretty weird film about a shy young man who develops a relationship with an anatomically-correct, life-size doll. Kieran Culkin began his acting career alongside his older brother Macaulay in the 1990 film “Home Alone”. Kieran’s most lauded performance was the title role in 2002’s “Igby Goes Down”, which earned him a Golden Globe nomination. A sergeant (Sgt) is a non-commissioned officer (NCO). Nipper is the name of the dog that appeared in the RCA logo. Nipper was a real dog, actually from England. His owner, Francis Barraud, made a painting of Nipper listening to a gramophone. Barraud then approached several gramophone manufacturers in the hope they would be interested in using the image for advertising. Nipper’s likeness was indeed picked up, and around that time it was Barraud himself who came up with the slogan “His Master’s Voice”. Eva Marie Saint is an American actor, who won the Best Supporting Actress Oscar for playing Edie Doyle in the 1954 movie “On the Waterfront”. My favorite of Saint’s movies is the 1959 Hitchcock classic, “North by Northwest”, in which she starred opposite Cary Grant. She ratcheted back her career at its height, right after her success in “North by Northwest”. Saint opted instead to spend more time with her husband and children, taking very few acting roles. That marriage is still going strong, and she has two children and three grandchildren. The 1954 drama “On the Waterfront”, starring Marlon Brando, told a story of violence and corruption among longshoremen. The movie was based on a series of 24 articles written by investigative journalist Malcolm Johnston and published in “The New York Sun”. The original news stories uncovered mob infiltration on the New York City Waterfront, but the location for the film was chosen as Hoboken, New Jersey. Something described as virulent is very poisonous or highly infective. The term “virulent” comes from the Latin word “virus” meaning “poison”. Cialis and Viagra are not just brands competing against each other, they also have differing active ingredients. Viagra is a trade name for Sildenafil citrate, and Cialis is tadalafil. Both drugs are used to treat erectile dysfunction, and more recently to treat pulmonary arterial hypertension. 4. Emphatic Acapulco assent : SI SI! Henri Rousseau was a French Post-Impressionist painter. He was self-taught, only starting to paint seriously in his forties. He worked as a tax collector until he was 49 years old, when he retired to focus on his art. Rousseau’s most famous painting is “The Sleeping Gypsy”, a celebrated work that depicts a lion standing beside a sleeping woman in the moonlight. You can take a look at it in New York’s Museum of Modern Art. The German for “one, two, three” is “eins, zwei, drei”. A molecule (mol.) is a basic chemical (chem.) unit. Jean-Paul Sartre was a leading French philosopher, as well as a writer and political activist. Sartre also served with the French army during WWII and spent nine months as a prisoner of war having been captured by German troops. He was one of the few people to have been awarded a Nobel Prize and to have then refused to accept it. Sartre was named winner of the prize for Literature in 1964, for his first novel “Nausea”. Before his win, Sartre knew that his name was on the list of nominees so he wrote to the Nobel Institute and asked to be withdrawn from consideration. The letter somehow went unread, so he found himself having to refuse the award after he had been selected. Red Bull is a drink from Austria that was introduced in 1987. Red Bull is the most popular “energy drink” in the world. There was some controversy in 2009 when it was discovered that Red Bull imported from Austria contained trace amounts of cocaine. “WALL-E” is a very cute Pixar movie, released in 2008. The hero of the piece is a robot called WALL-E, who loves his “Hello Dolly”, and who falls in love with another robot called EVE. Back in 1983, it was rumored that Atari buried a huge stash of unsold video games in a New Mexico landfill. The game in question was called “E.T. the Extra-Terrestrial”, widely panned as perhaps the worst video game ever produced. Partly because the burial took place close to the site of the Roswell UFO incident, and also because Atari denied that the event ever occurred, the destruction of the games became somewhat of an urban legend. Snare drums are so called because they have a set of wire strands (snares) stretching across the bottom surface of the drum. When the drum is struck, the snares vibrate against the bottom drumhead producing a unique sound. Avila is famous for the walled defenses around the old city, which date back to 1090. They were constructed out of brown granite, and are still in excellent repair. There are nine gateways and eighty-towers in all. Even the cathedral built between the 12th and 14th centuries is part of the city’s defenses, so it looks like an imposing fortress. Chrysanthemums are perennial flowering plants that are often called “mums”. A lacto-ovo vegetarian is someone who does not consume meat or fish, but does eat eggs (ovo) and dairy (lacto) products.